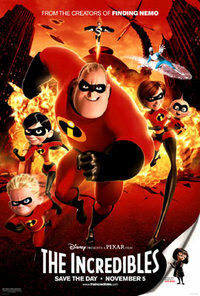 The Incredibles is an Academy Award-winning Pixar Animation Studios animated feature film. It was written and developed by Brad Bird, former director of The Simpsons and best known for directing the animated movie The Iron Giant. The Incredibles was originally developed as a traditionally animated movie, but after Warner Bros. shut down its animation division, Brad Bird moved to Pixar and took the story with him. The Incredibles is Pixar's sixth film. It was "presented" by Walt Disney Pictures and released by Buena Vista Distribution in the United States on November 5, 2004, and in the United Kingdom and Republic of Ireland on November 26, 2004. It was released in a two-disc DVD (in both widescreen and full frame versions) in the U.S. on March 15, 2005. According to the Internet Movie Database, the DVD was the highest-selling of 2005 with 17.38 million copies being sold. Fifteen years ago, the world's superheroes were overwhelmed by lawsuits over the damage and injuries that sometimes resulted from their rescues. In exchange for immunity from these suits, the "supers" retired from heroics, and the government relocated them with civilian identities. Now Bob Parr, formerly Mr. Incredible, lives a quiet suburban life with his wife Helen (formerly Elastigirl) and their three secretly super-powered children. Bored with this life of mediocrity, he occasionally sneaks out with his friend Lucius (formerly Frozone) to fight crime and protect the innocent. Upon receiving a mysterious benefactor's invitation to be a hero again, Mr. Incredible leaps at the opportunity. However, the "benefactor" turns out to be a villain named Syndrome who carries a grudge: as a boy, he had idolized the superhero, even going as far as inventing machines that would allow him to become "Incrediboy", but Mr. Incredible squelched that dream in an attempt to protect him. Thereafter he dedicated his life to eliminating superheroes while he perfects a destructive robot that only he will be able to defeat with his inventions; he plans on unleashing it for a while then defeating it so that he will be seen as a hero. It's up to the rest of the Parr family to save Mr. Incredible and to stop the robot after Syndrome loses control of it.